This is a little corker. You roast some whole almonds with the skin on, in a little oil. Watch them as they burn fairly easily; take some strips of Parma ham & bake them in the oven for a few minutes; get a bag or make yourself a good selection of mixed salad leaves; cut some rounds of goat cheese (petit chevron from Lidl is good): bake or grill them for the tiniest time. 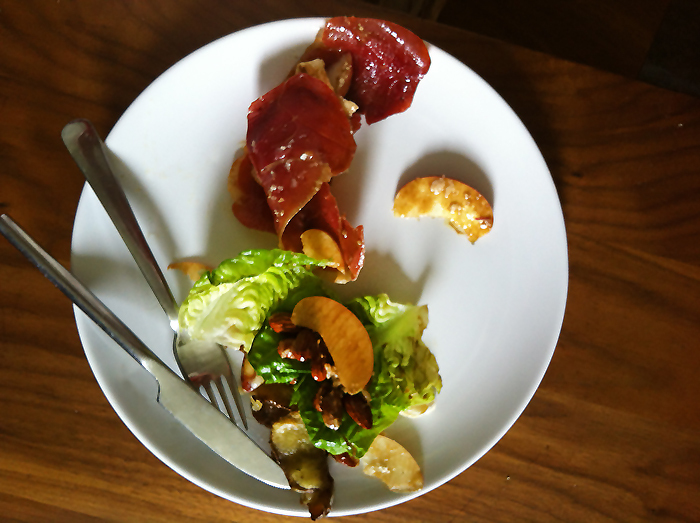 Slice up some nice sharp apple, like a Cox or Granny Smith, mix with the salad leaves & almonds. You then drape the Parma ham on top & carefully place two rounds of the goat atop the lot! Very yummy!